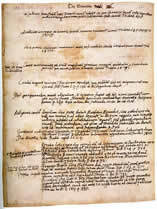 The massive, 1,200 page commonplace book of Sir Julius Caesar (1558-1636), providing detailed accounts of his reading from his early twenties until his death. John Milton’s commonplace book with notes on Ethics, Economics, Politics and Literature. There is much on marriage and divorce and on the topics of Tyranny, Liberty, Civil War and the King. The extraordinary prison notebook of Sir John Gibson (1606-1665), dedicated to his son, and supposed to provide a record of his life and experiences. The ‘Waferer’ commonplace book compiled c1591-1627, featuring verses by Essex, Ralegh and Shakespeare, as well as medical recipes, lists of books, and notes. Sir Walter Ralegh’s ‘Tower’ notebook, written c1606-1608 while he was imprisoned, replete with library lists, poetry and an illustrated guide to the Middle East. A commonplace book attributed to Thomas Harriot (1560-1621), polymath and friend of Ralegh, Kepler and Marlowe, featuring the earliest known quotation from Shakespeare’s Henry IV Part 1. Taken together, these commonplace books provide insights into what was read and what was considered important. They cover an astonishing range of subjects.